As a black college student who’s been obsessed with superhero movies since way back when Tobey Maguire was sporting red and blue, I was beyond excited to see the first black superhero movie. Yes, there was Blade (came out before I was born) and yes, there was Hancock (not even based off a comic book), but those movies weren’t BLACK superhero movies. I’m talking only two white guys in the whole cast black. I’m talking milk crates for basketball hoops in the projects black. I’m talking African lip plates and dashikis black. So before I dive into this review, just know I’m a little biased; I watched this movie twice with pure joy and pride like many members of the black community did, including Michelle Obama. From the moment Letitia Wright said, “WHAT ARE THOSE!” I knew Marvel’s “Black Panther” was truly for the culture. 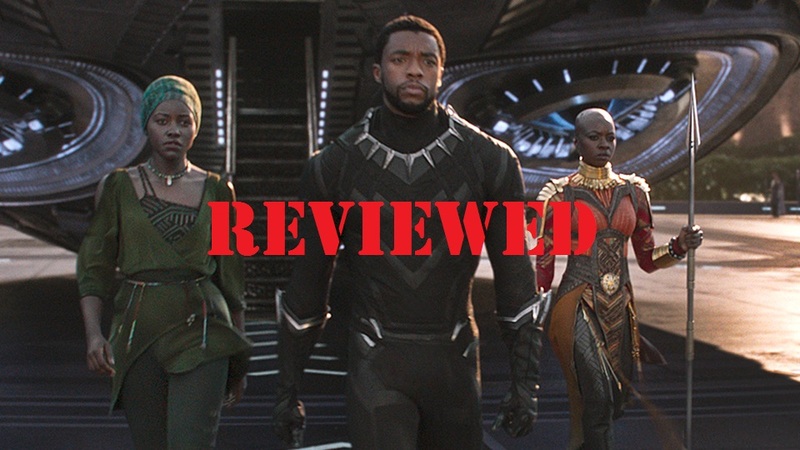 Everything from the film’s central conflict, to the powerful black women of Wakanda, right down to the accuracy of the African tribal wardrobe, shows there was a concentrated effort to make this movie something special for the black community and Marvel fans alike. “Black Panther,” directed by Ryan Coogler, tells the story of T’Challa (played by Chadwick Boseman), the King and guardian of the technologically advanced African nation, Wakanda. As the fictional country’s new leader, he must deal with issues from the outside world as well as the mistakes of his deceased father. These mistakes are what creates the film’s main villain, Erik Killmonger (played by Michael B. Jordan). While Jordan’s performance as Killmonger may feel a bit overacted in some scenes, the character itself is one of Marvel’s most complex villains to date. With the lives of struggling black people around the globe being his motivation, it’s hard not to root for him … aside from the fact that he’s a homicidal psycho. Every time I found myself wanting him to succeed, he’d do something evil like choking an old lady to snap me out of it — that’s how a good villain should be. Another highlight of the film comes in how bad*ss the women of Wakanda are. The black women in this film aren’t overtly sexualized or damsels in distress, instead they boss up and show how powerful they are. Princess of Wakanda and teenage sister of T’Challa, Shuri (played by Letitia Wright) is the overseer of Wakanda’s technology and sciences. Her added humor steals the show at several points in the movie like her aforementioned quote. T’Challa’s love interest, Nakia (played by Lupita Nyong’o) is more than a Lois Lane character archetype. T’Challa interrupts the Wakandan spy’s undercover mission because he needs her by his side as he’s dealing with the stresses of losing his father as well as becoming king. Okoye (played by Danai Gurira) is the fierce leader of the all-female Wakandan special force team, the Dora Milaje. She fights alongside Black Panther and has plenty of memorable moments, such as the scene where she uses her wig as a weapon or the scene where mid-car chase she gets on top of the car and hurls her vibranium spear like an Olympic javelin thrower. The women of “Black Panther” don’t take a back seat to T’Challa in the film, instead, they often lead the charge and make the scenes. From the wardrobe to the scenery, “Black Panther” is visually magnificent. T’Challa and Killmonger’s sleek Black Panther suits are arguably the cleanest Marvel superhero costumes to hit the big screen to date (it’s between them and Iron Man/War Machine). The colorful tribal garments and body paint the different Wakandan tribes wear are inspired by real African tribes. Wakanda looks almost as stunning as the wardrobe. With futuristic skyscrapers and beautiful natural scenery, these effects are put on full display in the scene on top of the waterfall where T’Challa is crowned king. While it is easily one of the better Marvel movies and undoubtedly the blackest, there are two problems that hold “Black Panther” back from its full potential. First, T’Challa comes off as a bit boring compared to all the other characters. Killmonger is a borderline psychopath willing to kill anyone in the way of his goal. Shuri is highly intelligent but still has plenty of moments of humor and sassiness. As for T’Challa … he’s … a nice person … I guess? There aren’t many moments showing who he is beyond being a guy with the cool black catsuit. Even Danai Gurira’s performance as Okoye has more scenes that evoke emotion and she’s supposed to just be a fierce warrior. My second problem with the film is a bit nit-picky. I don’t wanna be that guy who questions the realness of something in a fictional superhero movie, but T’Challa manages to survive being thrown off a cliff after being beaten to a pulp by Killmonger. Then after suspending reality for that, I’m supposed to also believe he’s somehow kept alive while in a coma by being submerged in snow. I know the easy response is “It’s a superhero movie, it’s not supposed to be real. Duh!” but he was also stripped of his powers before this happened, so this took me out of the movie a bit. “Black Panther” is black excellence brought to the Marvel cinematic universe. There are so many great black actors that performances by Forest Whitaker and Angela Bassett feel like an afterthought (even though they’re also pretty great). Aside from T’Challa’s highly unlikely survival from being thrown off a cliff, the story is just as spectacular as the cast. While it follows the typical Marvel big screen formula to an extent — the same old “It’s not about the hero’s powers/suit, but the man behind the mask” trope and a dash of funny moments for seasoning — it’s not enough to get in the way of the film feeling unique. The only thing that really holds things back is T’Challa himself, but hopefully, this is addressed in the sequel.